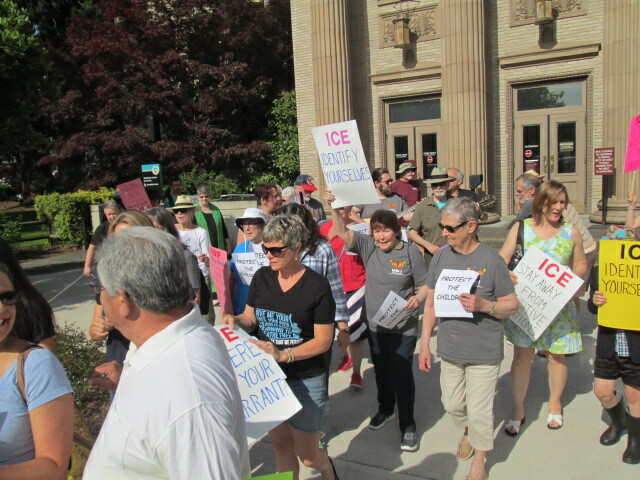 Vigil attendees at the Washington County Courthouse protested families being separated at the U.S. boarder with Mexico in the new "zero tolerance" policy. More than 40 people gathered at the Washington County Court House Monday morning to express their concern about children being separated from their families by immigration agents at the U.S. border. The court house was chosen as a site because ICE agents have been active there targeting Latino-appearing people. The vigil coincided with a weekly Monday 9 a.m. vigil that originated because of that ICE activity. Parishioners from several Washington County parishes including Holy Trinity, St. Pius X, St. Juan Diego, and St. Alexander attended. Many were heartened by the recent U.S. bishops’ statements calling the separation of children and families immoral. The rally was an interfaith gathering which included people from Protestant churches in Tigard, Beaverton, and Hillsboro, and people who did not claim a religious association. The ACLU provided several observers. Near the end of the vigil, 123 seconds of silence was in honor of the 123 immigrants who are currently being held in the federal penitentiary in Sheridan Oregon, some of whom had not been allowed phone calls or legal visits since they were detained more than a month ago.